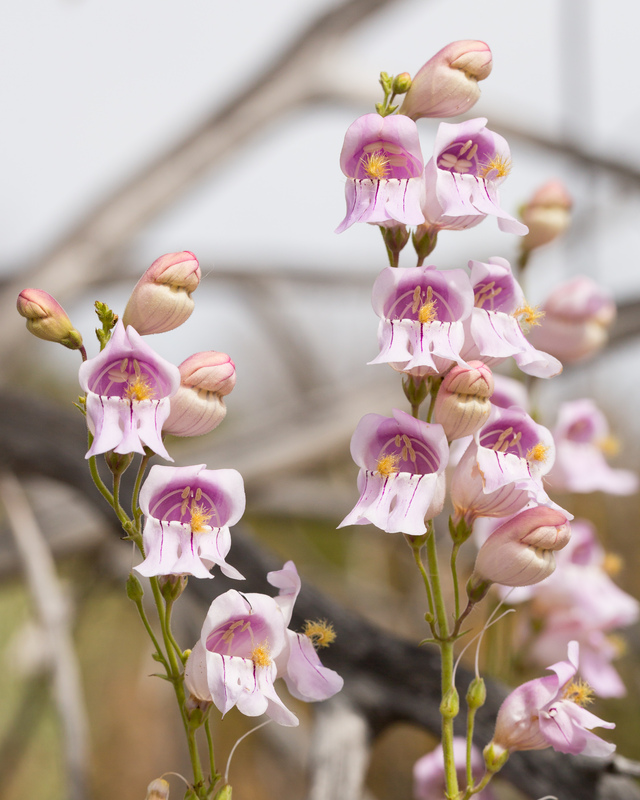 Palmer’s Penstemon was named for Dr. Edward Palmer (b. 1831, d. 1911), an ethnobotanist and botanical explorer. He is considered the “father” of ethnobotany, and he worked extensively in North America and South America during the 19th century. You can read all about him at the Smithsonian Institution website: Edward Palmer Collections. There are three varieties of Penstemon palmeri: var. palmeri has a glandular inflorescence, whereas var. eglandulosus is glabrous; var. macranthus has stem leaves that are slightly different (not connate as compared to connate in the other varieties), and it is restricted to the mountains of the eastern parts of Churchill and Pershing counties plus Nye county in Nevada. I’ve found variety eglandulosus on the northern side of the Grand Canyon, but the most common variety you are likely to encounter is var. palmeri. The species is broadly distributed in the Mojave Desert ranging from eastern California, western Utah, Nevada, and western Arizona. I’ve collected this species up on Mount Lemmon near Tucson, also. 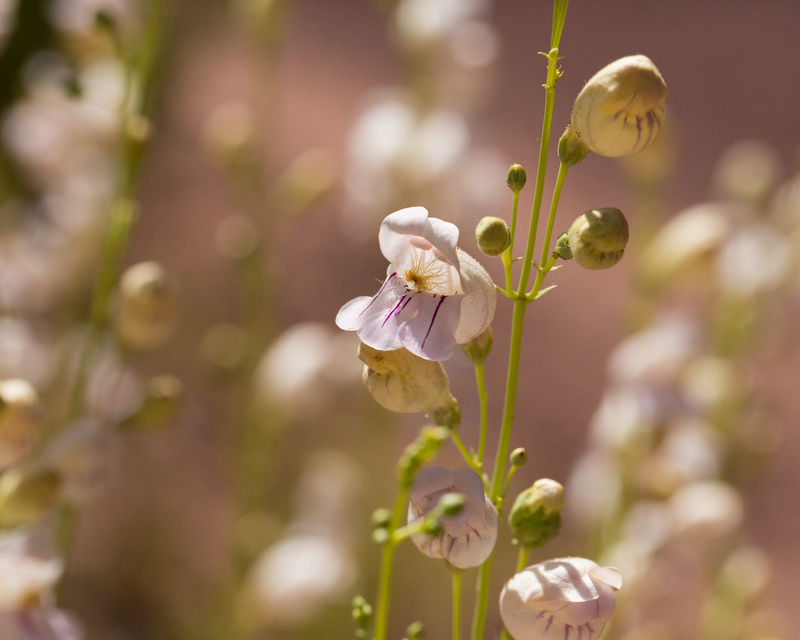 The species is also widely planted as a roadside ornamental – especially along the freeways and highways in Idaho and throughout the American southwest. It’s a very showy plant in the wild and in cultivation, having flowering stems up to nearly 2 m (6 feet) in height, blooming from May to August, depending on the elevation. It has a wide elevational range as well as its geographic range, occurring from 790 m (2600 feet) to 2700 m (8950 feet). 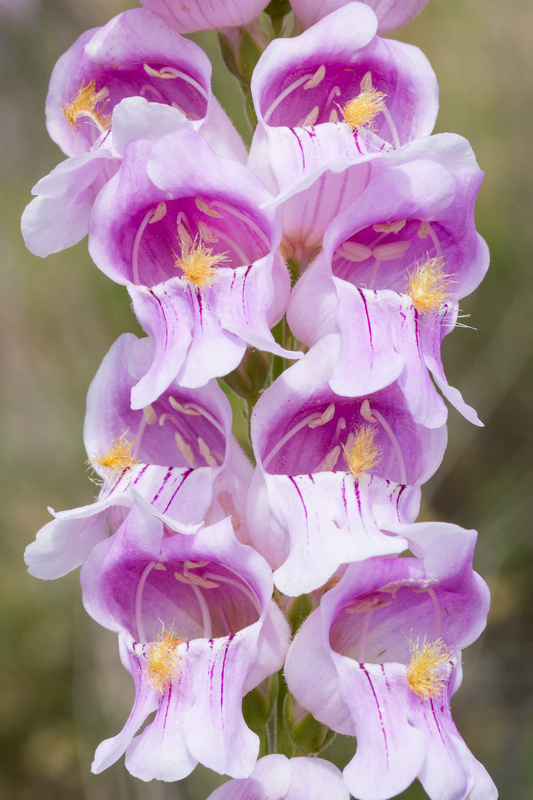 The American Penstemon Society members report that it blooms well for two years and then needs to be replanted. 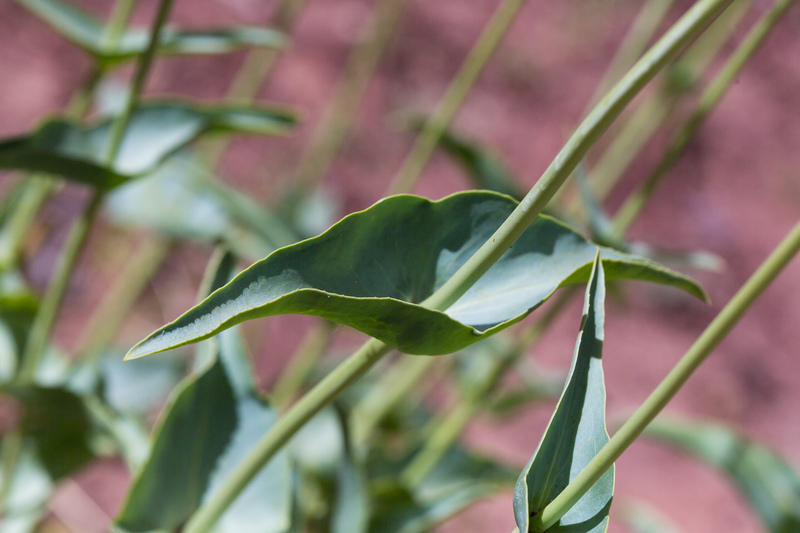 Fortunately, it produces a lot of seed, which can be germinated without refrigeration. It is cold tolerant to about 0°F. I first became acquainted with P. palmeri while working on my dissertation project – a test of Straw’s classic hypothesis on diploid hybrid speciation (Straw 1956a). To put it mildly, it blew me away. I had been familiar with P. grinnellii, a close relative (and a member of Straw’s hybrid complex), but the flowers and size of P. palmeri, plus the presentation of the flowers, is like looking at P. grinnellii on steroids. 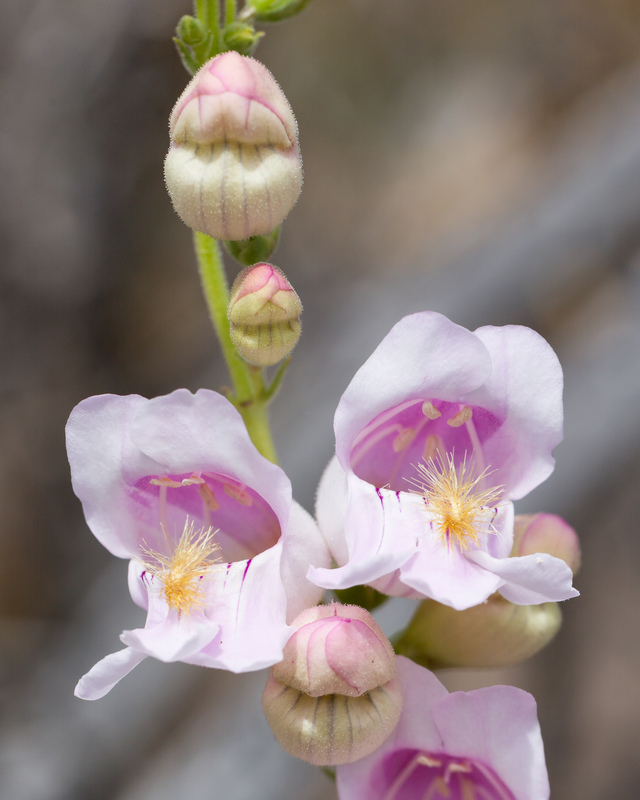 My most recent encounter with this charming species was from last month while participating in the American Penstemon Society meeting in Utah. We did a field trip to the Beaver Dam Mountains, where we found P. petiolatus, but did a stop along the way to look at a large population of P. palmeri. 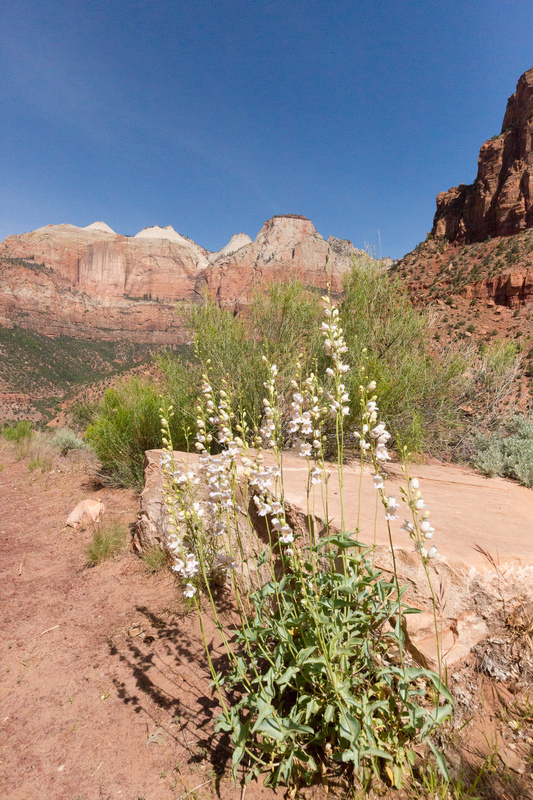 I also photographed this species in Zion National Park. Penstemons are called the beardtongues for a good reason. Most species have a staminode with bristles. Four anthers are in two pairs at the top of the flower, but the staminode curves down to the floor of the corolla tube. The staminode has a function in pollination. Richard Straw used a line drawing very similar to this dissection photo I made many years ago in his classic paper “Adaptive morphology of the Penstemon flower” (Straw 1956b). From this photo you can see why the common name for Penstemon is Beardtongue, named for the very hairy staminode that is so prominent in P. palmeri. Not all species have this type of staminode. For example, hummingbird pollinated species have very inconspicuous and mostly glabrous staminodes. Wasp-pollinated species also tend to have glabrous staminodes. 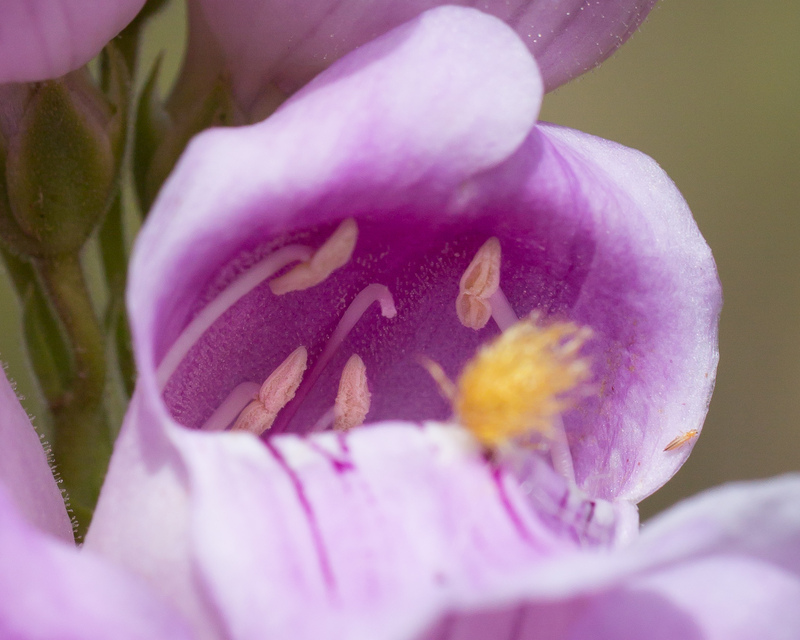 There has been a lot of research done on the role of the staminode in Penstemon. Straw (1956b) thought it was for protection of the ovary and for facilitating pollination by insects that cling to or climb upon the staminode. More recent research has demonstrated that the staminode does facilitate pollination in bee-pollinated species by acting as a lever to bring the insect into contact with the stigma (Walker-Larsen & Harder 2001; Dierenger & Cabrera R 2002), but also may hinder access to the nectar, which would keep a bee in contact with anthers and stigma for a longer period (Walker-Larsen & Harder 2001). There is no apparent function for the staminode in hummingbird-pollinated species [ibid]. 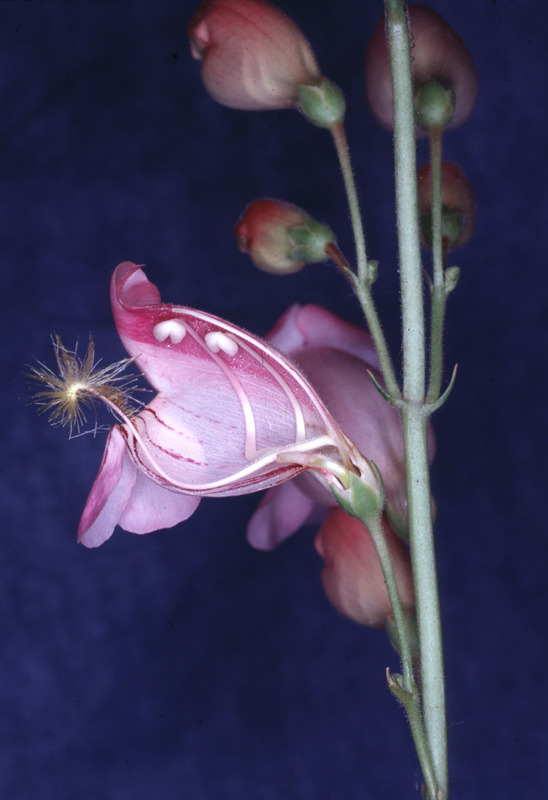 Dierenger G, Cabrera R L (2002) The interaction between pollinator size and the bristle staminode of Penstemon digitalis (Scrophulariaceae). Amer. J. Bot. 89, 991-997. Straw RM (1956a) Floral Isolation in Penstemon. Am. Nat. 90, 47-53. Straw RM (1956b) Adaptive morphology of the Penstemon flower. Phytomorphology 6, 112-118. Walker-Larsen J, Harder LD (2001) Vestigial organs as opportunities for functional innovation: the example of the Penstemon staminode. Evol. 55, 477-487. The stem leaves of Penstemon palmeri are connate – fused around the stem. Variety macranthus has leaves that are slightly different than this arrangement. All photos by Andi Wolfe ©2014 – All rights reserved.